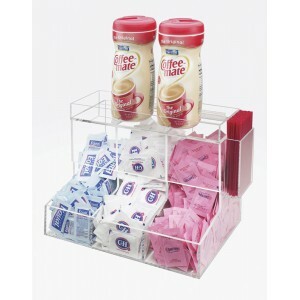 Classic Coffee Condiment Organizer - Cal-Mil Plastic Products Inc. This condiment organizer is a great way to display and hold packets, stir-sticks, and creamers. It features a black body that will complement any food service area. Dividers separate this unit into 9 individual compartments of varying sizes to accommodate all of your condiment needs. A wide middle compartment is perfect for napkins, while 8 smaller spots separate sugar, creamers and more! It is perfect addition to any coffee station, while it offers organization and a bold look to impress your guests!